The most exciting weekend for fans of London’s West End is merely a week away. 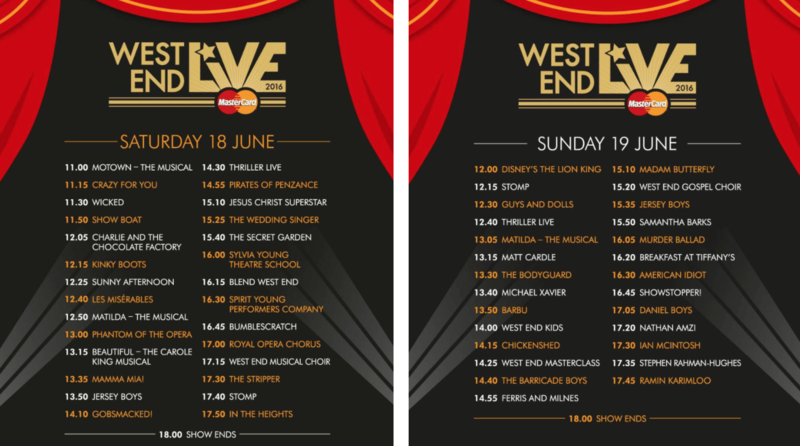 West End Live – a free festival in Trafalgar Square that showcases the best of the West End, returns on the 18th and 19th of June. West End Live is my musical theatre highlight every year, as it gives everyone a chance to enjoy the extraordinary talent and variety of London’s West End and it costs absolutely nothing. Despite regularly visiting the West End, I was surprised by the amount of shows I had never even given a second look until I saw them perform at the festival, I wrote about my stand out shows that performed at the festival last year. A multitude of West End musicals will take to the stage to perform a number of hit songs from their shows. Highlights last year include the Jersey Boy’s extensive set that had the audience singing and dancing along, and Miss Saigon’s heart-breaking duet, with their stunning harmonies projected across the whole of Trafalgar Square – it was a moment to remember. Organised by Westminster City Council and Official London Theatre with support from the Mayor of London, West End Live is in association with MasterCard which means there will be numerous chances for MasterCard holders to win Priceless Surprises over the course of the weekend. If you are a fan of musical theatre you’d be silly to miss out on the festival as it is probably the only chance you’ll be able to see the stars of the West End perform live on stage and you are encouraged to sing and dance along. You’ll see the musicals in a brand new light when you’re diggin’ the dancing queen with the cast of Mamma Mia and blaming it on the boogie with Motown the Musical. Attracting crowds of more than 500,000 people over the weekend, West End Live is the largest live outdoor musical theatre event in the world.